JBL has successfully managed to tap into the portable speaker market with a diverse range of products catering to different budgets. It has to deal with stiff competition from Sony and Ultimate Ears, but due to its wide presence in pretty much every brick and mortar electronics store in India, the company has managed to hold its ground. The JBL Flip and Charge series of Bluetooth speakers are quite popular, and now the company is adding a new model in the in the form of the Flip 4. This new Bluetooth speaker offers complete waterproofing, so it can be submerged in water, unlike its predecessor, which could only handle splashes. There’s also a new shortcut which lets you access Siri or Google Assitant with a single button press. JBL has priced the Flip 4 at Rs. 9,999, and it competes with Sony’s SRS-XB30 and the Ultimate Ears Boom 2. Let’s see how it good it really is. The Flip 4 carries forward the same cylindrical design as its predecessors, and is available in multiple colours. It’s easy to grip with one hand and isn’t too heavy either, weighing in at 515g. Nearly the entire body is covered in a mesh fabric except for the edges and a silicone strip that runs across the length of the speaker. The Flip 4 is designed to be used in a horizontal position as there are passive radiators on either end. There are buttons for controlling music playback and Bluetooth pairing. They have a nice clicky feel to them but they aren’t illuminated. Despite the cylindrical design, the Flip 4 doesn’t roll around, as the silicone strip bulges out a bit, providing nice base for the speaker to rest on. At the back, the Flip 4 has a backlit power button, five LED dots to show you the battery level, and a backlit Connect+ button, which lets you link more than 100 Flip 4 units together. Next to them is a rubber flap to protect the Micro-USB port and a 3.5mm auxiliary connector. The Flip 4 also has a loop with a pre-installed lanyard so you can hang the speaker on something if you don’t have a proper surface for it to stand on. The JBL Flip 4 is very similar to the outgoing model when it comes to specifications. The Bluetooth version has been upped to 4.2 but it still has two 40mm full-range drivers that deliver a total power output of 16W. It supports a frequency response of 70Hz to 20,000Hz, and Bluetooth profiles including A2DP V1.3, AVRCP V1.6, HFP V1.6 and HSP V1.2. You get a 3000mAh battery, which is good for a rated 12 hours of continuous playback, and a microphone so you can answer calls. There aren’t any extra frills like NFC or aptX HD support here. In the box, you get some documentation and a matching Micro-USB cable. The big update here is the addition of IPX7 certification, which makes the Flip 4 submersible up to 1m of water for up to 30 minutes. The Flip 4 can handle two active Bluetooth connections at the same time, which useful, especially when you’re having a party and want to share DJing duties with someone else. The speaker feels pretty rugged and seems as though it could take a tumble or two without shattering, even though it doesn’t meet any formal standards for ruggedness. The diffused LED lights on the speaker aren’t annoyingly bright in the dark, but we wish the controls lit up too. As good as the build quality may be, the Flip 4 does have one design flaw in our books, and that’s the exposed passive radiators on either side. From an aesthetic standpoint, it looks really cool to see them vibrating furiously when playing music, but this also makes them vulnerable to damage from small objects like pens and keys in your bag. A removable cover of some sort would have been nice. The Flip 4 is simple enough to set up. You get audio cues for when it’s powered on or off and when it’s paired with a device. 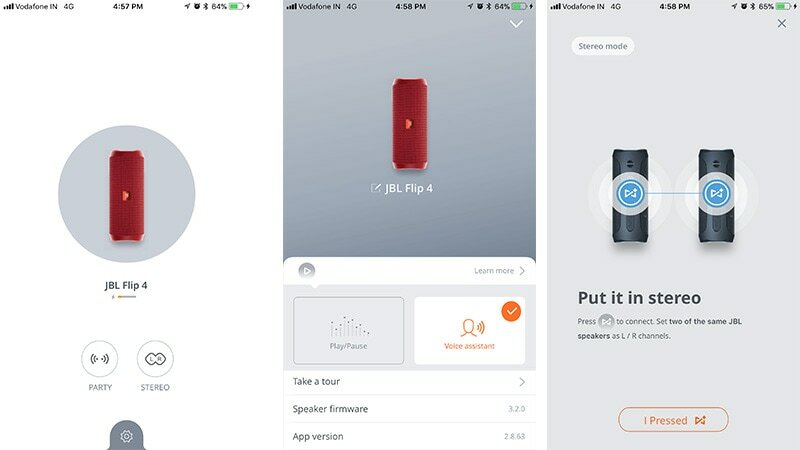 The JBL Connect app for iOS and Android lets you sync multiple Flip 4s in ‘party mode’ to fill up a large space, or use two units in a stereo configuration. The app also shows you the battery level of the speaker and lets you change its name. Besides this, you can use the app to change the Play button’s functionality to either play/ pause the current track, or call up the assistant (Siri or Google Assistant) on your device. You can activate your phone’s assistant with a long-press of the same button anyway, but this way, you save a few seconds. It’s a thoughtful addition for those who actually use voice assistants through a Bluetooth speaker, but in doing so, you lose the ability to pause music directly, which is we don’t feel is worth the tradeoff. Another odd thing we found is that there’s no way to go to the previous track, just a double tap of the Play button to skip to the next track. Audio performance is pretty impressive considering the size of this speaker. The advantage of the Flip 4’s design is that good bass isn’t dependent on any surface to reflect sound off. The bass is punchy and can be felt even at moderate volume levels (around 50 percent). In tracks like Long Road To Forgiveness by Jason Mraz and Brett Dennen, vocals are delivered crisply with the subtle bass clearly audible in the background. You can’t feel the sub-bass as much in bass-heavy tracks like The Weeknd’s Starboy, and the bass starts sounding flat above the 85-90 percent volume level. Still, it doesn’t get boomy, and as long as you stick to a 70-80 percent volume level, you should be good. This is well demonstrated with the track Lock Doh by Giggs. The Flip 4 really shines in vocal-heavy tracks, but the mid-range isn’t always showcased well, which is evident in Michael Jackson’s Billie Jean. Highs are reproduced well without sounding piercing. The soundstage is good but it doesn’t quite have the same effect as you’d get from an omnidirectional Bluetooth speaker. We tested the Flip 4 mostly with an iPhone 6s Plus but also streamed music and movies from a MacBook Air. it can pull off speakerphone duties when needed but we found that we had to be pretty close to the speaker for the caller to hear us properly, or we would need to shout. Waterproofing seems to work well. We tried dunking the Flip 4 in water and it continued working just fine. Bluetooth range is pretty good too, and we didn’t face any major sync issues even when 15-20 feet from the device, without a clear line of sight. We also didn’t think there was much of an audible sound difference when switching to a wired connection. JBL rates the battery life at 12 hours, but of course, this number is achieved only in ideal conditions. During actual use, we played music for five straight hours (mostly at 60 percent volume) and took a few calls in between, and managed to knock off just two of the five battery dots. After about 10 hours, we were down to one dot, which brought us pretty close to the rated battery life. When it’s really low, the last dot flashes red. The dots only light up when you press any of the buttons. The speaker charges pretty quickly if you use a 10W (5V, 2A) power adapter. We were able to charge it from about 10 percent to 100 percent in 1 hour and 40 minutes. The Flip 4 is a mighty performer given its tiny size, and is another solid option in the sub-Rs. 10,000 segment. Its sound isn’t perfect, as the mid-range isn’t distinct enough, and vocals can be overpowering. However, it does deliver good bass, provided you keep the volume level under 90 percent. 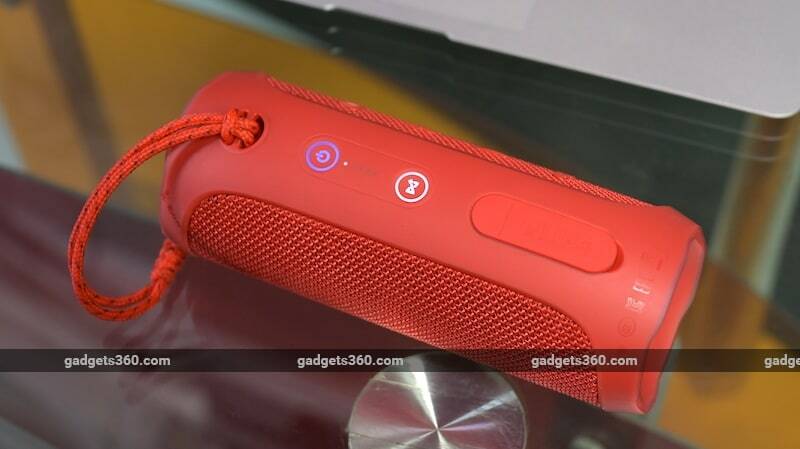 Battery life is fine, and we love the compact and rugged design of this speaker. We’re not too happy with the exposed radiators, which we feel could be damaged too easily. The UE Boom 2 has dropped in price since it launched last year, and can be found for a little over Rs. 10,000 online. Compared to the UE Boom 2, the Flip 4 offers more user-friendly controls and a more compact design, which makes it a good alternative. A Week Left for Your CFA Exam, What Do You Do? Hello there! Welcome to my blog! I’m so glad you decided to visit!! © 2019 Max Line All Rights Reserved.